For about 8 months I have been faithfully working out with a personal trainer. I like to say she comes to my house to beat me up once a week. Seriously, this is the reason my abs are in pretty good shape today; they were getting a little doughy. 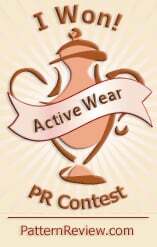 Up until now I was wearing exercise gear which had really seen better days. 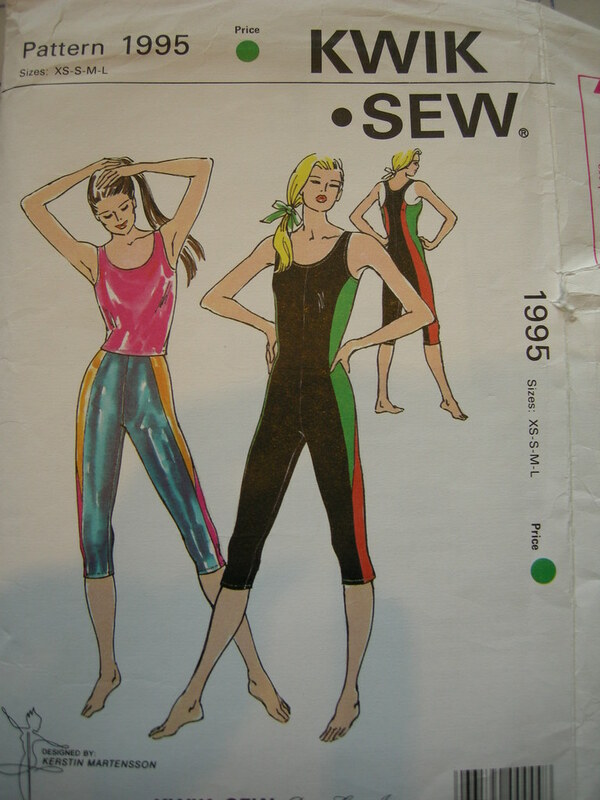 I was a YMCA member in the 1990s and sewed a bunch of tights/leotard combo outfits for my step class (stop laughing!). Time for some new stuff. In Montreal at PR Weekend one of our big draws was that Jeanne Binet and Émilie Fournier from Jalie Patterns were in attendance, and would do a sewing demonstration for us. Jeanne set up her Pfaff Creative 4.0, and BabyLock serger and coverstitch machine and talked pretty much nonstop about what she was doing, with Émilie translating as she went. She had prepared 6 garments and partially sewed them up to demonstrate the techniques and construction methods needed for each. One is a new pattern (to come out before the end of September, we were told) for a dress with two bodice views. 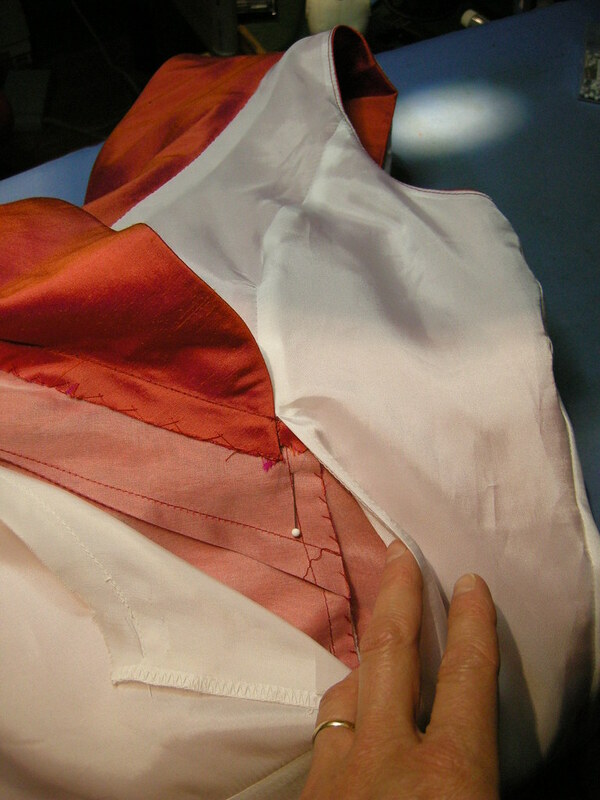 This pattern will unveil a new technique for finishing and binding the edges (neckline and armscye) of a stretchy garment, without using elastic. Jeanne gave us the preview, and it is a really wonderful technique that produces a stable and professional-looking finish and, best of all, you do not need to fiddle with any elastic. The next day, Jeanne and Émilie took us to three of their favourite stores in Montreal for buying stretchy exercise/technical fabrics - Suzie Spandex, Stretch Text and Tonitex. These are all located on St. Laurent Blvd, north of highway 40. I had been to Tonitex before but would never have found the others which are located upstairs in a nondescript building. But my first piece of fabric purchased in Montreal has been sewn up, along with a good chunk of fabric I probably bought 10 years ago. To the right is the completed outfit. 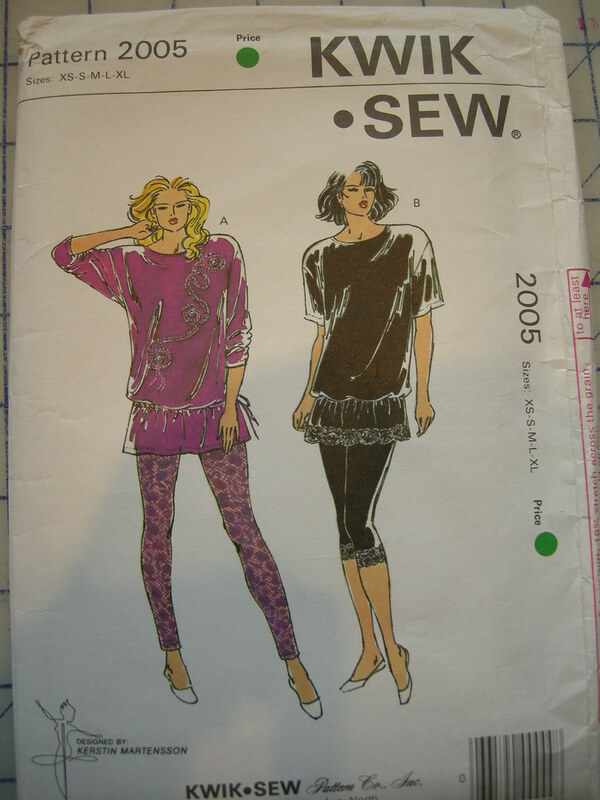 This is from three different Kwik Sew patterns which I have had for many years. The top is from KS 1995, which is actually 20 years old (ca 1990 or as KS amusingly styles their copyright date, MCMLXXXX). The unitard is rather fetching, no? The shorts are from another 1990 beauty, KS 2005. Gotta love the heavily shoulder-padded T-shirt (not) but the tights are classic - and super easy to make with only two seams). And there's a sports bra too, which is made from KS 1567 from 1986. It's very Jane Fonda. I bought the patterned jersey in Montreal. It seems to be a sort of cottony blend and only has moderate stretch. The rest of the outfit is some lovely supplex nylon/lycra. I love this stuff. It feels soft, never fades, and wears like iron. I used Jeanne's new technique to bind the edges on the tank. Here are some photos. First, cut strips of a jersey fabric - you can use the same fabric or, as I'm doing, choose a coordinating jersey. 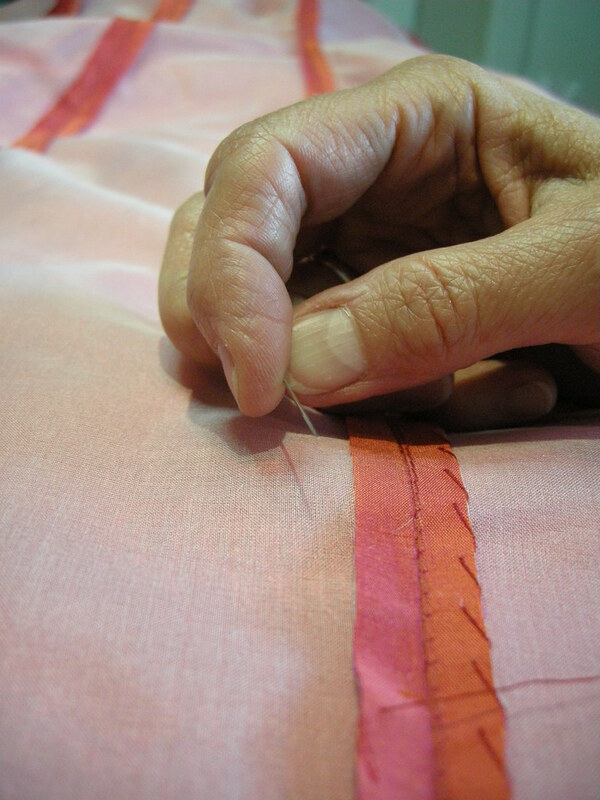 The strip needs to be about 90% of the length of the opening you are binding, and the width is a hair over three times the width of the serged seam. I'm using a 4 thread safety stitch which is about 6.5mm wide (1/4") and my strip was 22mm (7/8") wide. The strip is cut along the lengthwise grain of the jersey. This grain is more stable and the strip will curl along its length towards the right side. 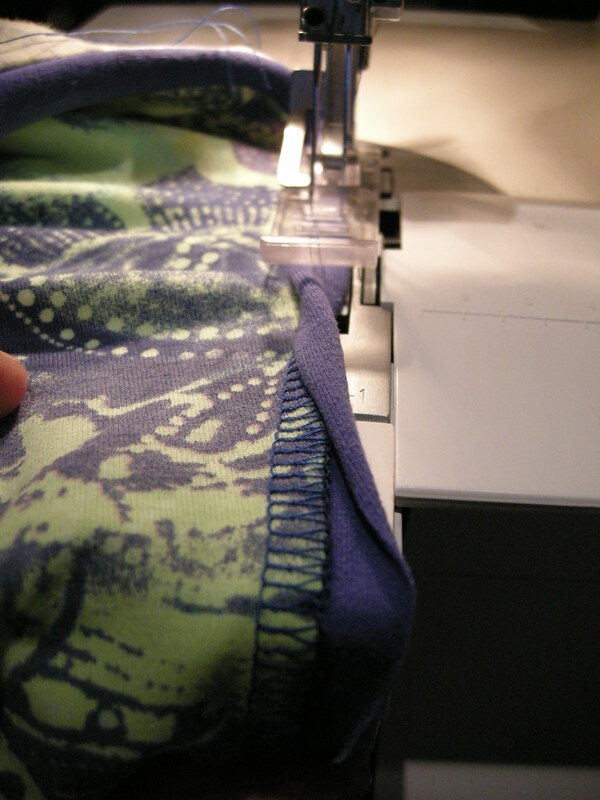 Sew the strip in a loop with a tiny seam. Mark the quarter points on the loop and do the same on the edge you are binding. Then serge the binding loop to the garment, letting the knife just skim the edges without cutting off any fabric (Jalie and KS both use narrow seam allowances). 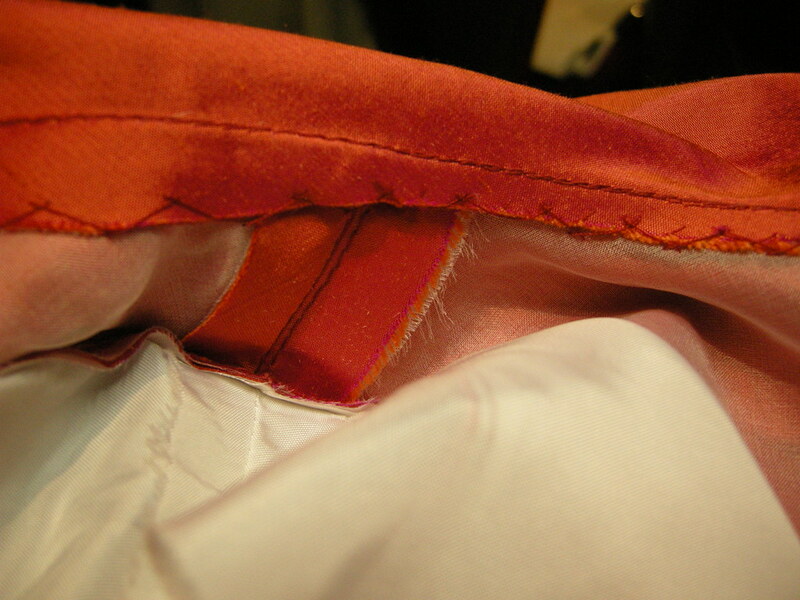 Ensure that the binding will curl towards the seam (as shown to the left). If you want the binding to be visible on the outside of the completed garment, sew it to the WRONG side of the fabric, as I have done. 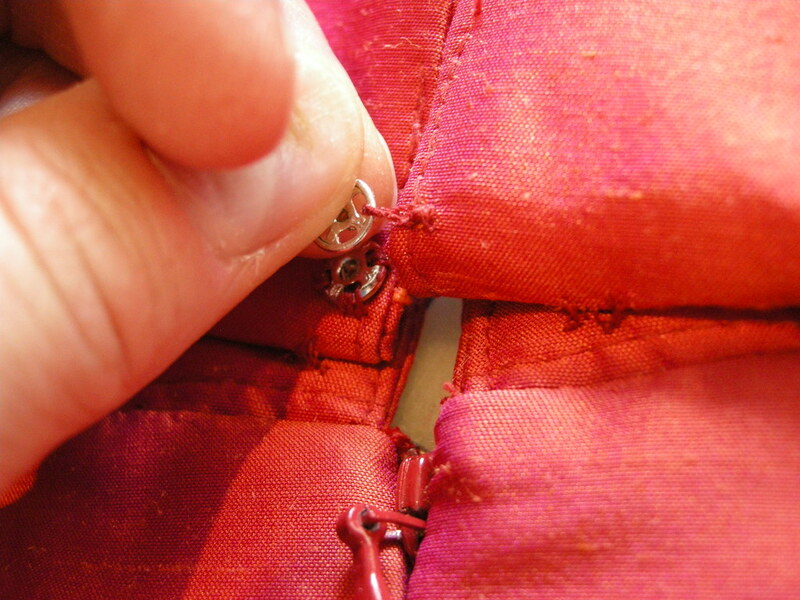 If you sew to the right side, your binding will be inside. 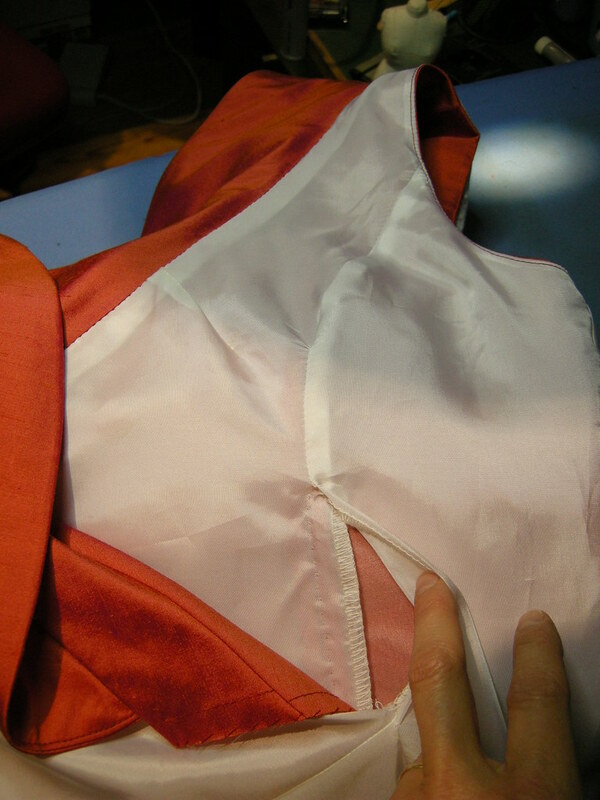 Smooth the serged seam towards the binding. 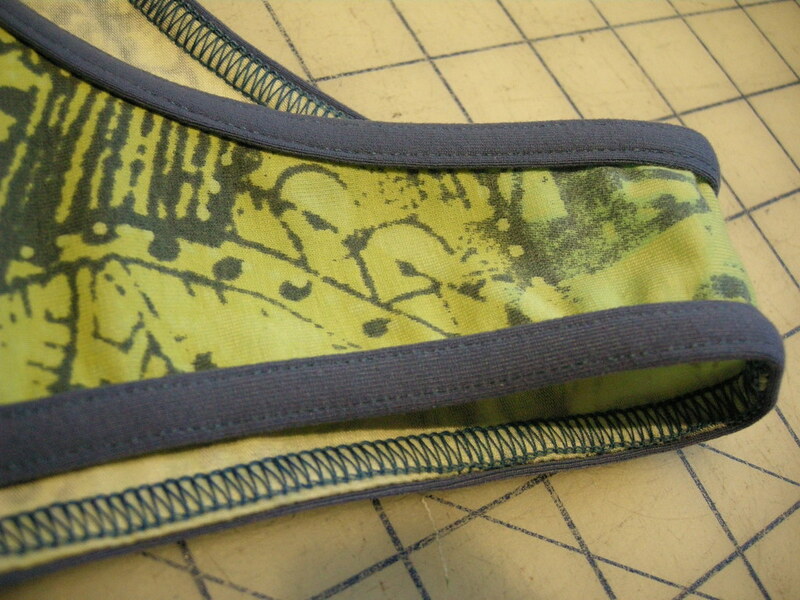 Then flip the binding over the seam allowance - it should just cover the stitching. The last step is to fold the entire thing along the seam line, and using your cover stitch machine, topstitch neatly. I hope you can see how this works from the photo to the right. This is a wonderful finishing technique for knits. To the left is a close up of the completed top. Two days after and I'm still tired! Meeting 50 or so other sewists, most of whom were strangers before the weekend, and spending two intense days with them was kind of overwhelming, in a very good way. The organizing of it was somewhat tricky, but my part was nothing compared to the burden Anne-Marie (Mahler on PatternReview) took on so masterfully. She should put this event on her resumé! It all came off without a serious hitch, and judging from the comments afterwards, a good time was had by all. Deepika (owner of PR, for the uninitiated) has posted a very good account. There are even some pictures of me in her post. Let's see ... I hardly know what else to add. I was very undisciplined in the fabric-purchasing department. Must do penance ... where's my hair shirt? I must have some suitable fabric to make one in my extensive stash. Seriously, the biggest problems with my burgeoning stash are (a) shortage of storage space and (b) shortage of time to sew it up. 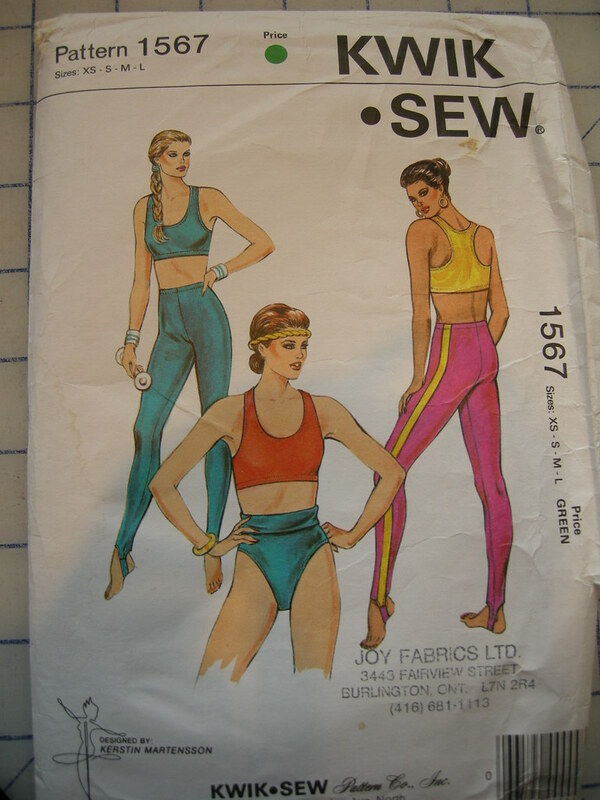 I'm not confessing the details, except to say that I will never again lack for great exercise wear (assuming it gets out of flat folds, that is). And I did buy two lovely pieces of wool to coordinate with two dress-lengths, which was a goal of mine for the day. PR Weekend Montreal is almost over (sniff) but I wake up early in the dorms so have a bit of time to write this post and illustrate the completed definitely-not-black dress I made for the cocktail party on Friday evening. Without further ado... some details. The silk organza/dupioni both frayed terribly. To keep everything neat and tidy I first trimmed the seams to get rid of the developing fringe, then (as you have already seen) I hand-overcast the seam allowances to prevent further fraying. Susan Khalje's on-line course at PR definitely came in handy. It's not rocket science but it was nice to have her illustrated materials as confirmation that what I was doing was expert-approved. 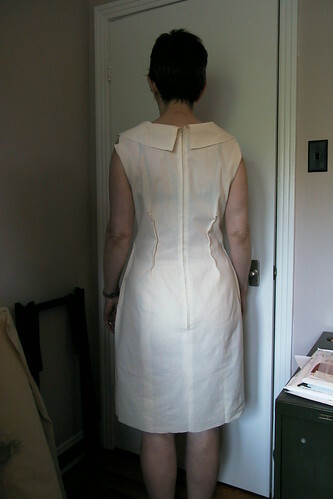 Since I was into hand-sewing (so liberating to find out that Susan K, like me, cannot figure out how to use a thimble), I'll just mention that I also hand-felled the lining to the neckline and zip (see left, ignore the slightly wobbly understitching at the armscye edge). Before that, I catch-stitched the (trimmed and overcast) seam allowance of the neck/collar to the underlining to keep them in place (at right). At left, you can see the right side (overlap) lining. The left side (underlap) is folded down and out of the way. 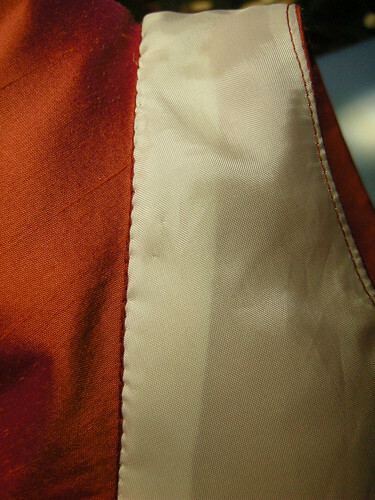 You can see that there is an opening in the lining seam on the right side. (being held down.) I'm going to hand-sew the lining of the overlap at the SA, place the underlap on top, then close the opening in the lining seam to finish it all. At right, I have pinned the left front (underlap) to the princess seam at the right front. This hides the right side lining which was already tacked down in the same place. Next, I will hand sew the left front down where it's pinned. 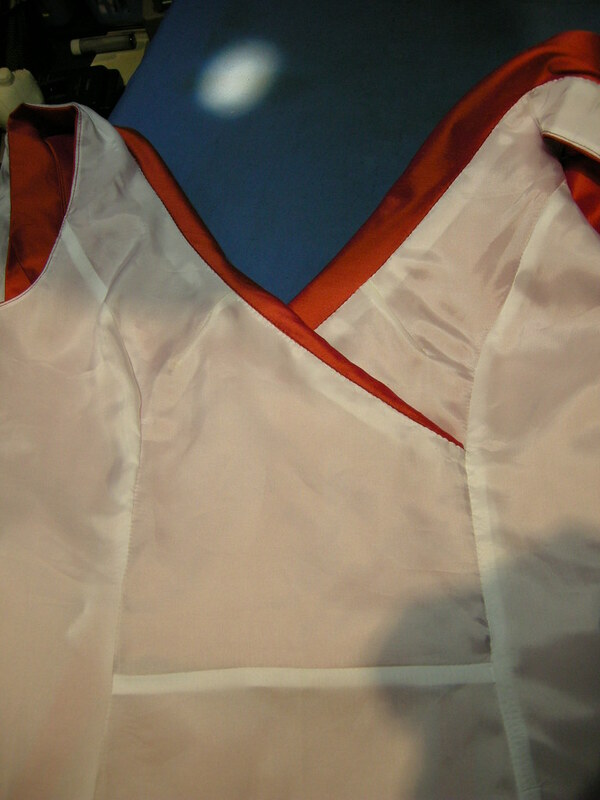 The completed inside lining can be seen on the left. Other hand-sewn details included that the lining is attached with thread chains to the hem to prevent it from sliding out when I sit down, and I attached a snap at the inside of the collar at the back to keep the edges together. And finally, some views of the completed dress. It did not win a prize for me at the contest - there was very stiff competition! I got all excited for our planned Cocktail Party at PR Weekend Montreal, because in real life I never go to dress-up cocktail parties - and then the Vogue patterns for summer were announced and I chose Vogue 1182, the Kay Unger dress with draped cross-over front and lovely wide collar. 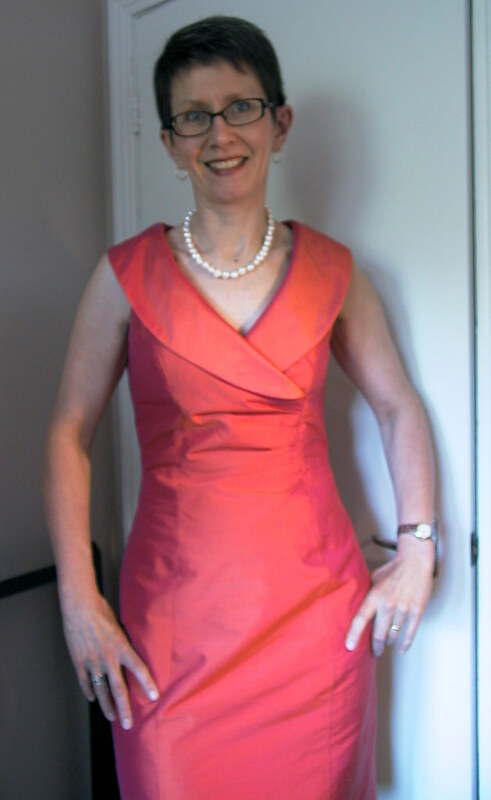 The red version of this dress is obviously sewn in silk dupioni and I decided to baldly imitate Vogue. I chose one of those fantastic iridescent dupionis where the warp and weft are different colours - in my case fuchsia warp is combined with a brilliant orange weft. This photo just does not do justice to the richness of the fabric in person but it'll have to do. But first to muslin the pattern. Normally, I'm all for cutting Big 4 patterns, but in this case two of the pattern pieces (the side front and side back) were not nested in the usual way. This made switching between sizes (which I have to do with 2 sizes difference between bust/waist and hip) impossible, so I started by tracing these pieces. Grrr. Vogue says this pattern is "average" difficulty. The reason is that it has 4 different centre front pieces - the full length right front (overlap) with pleats, the half-length left front (underlap) with a dart running from the princess seam to bust point, the half-length upper CF lining with a dart running from the neckline down to the bust point, and the half-length lower CF lining. 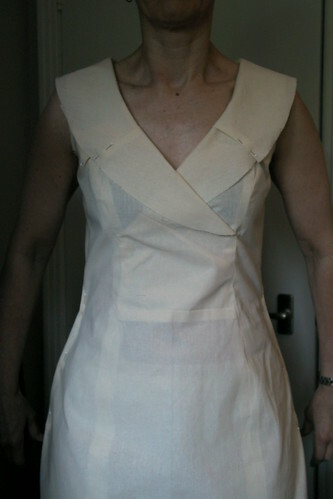 To test the pattern, I used the lower CF lining piece plus the upper left front. I cut a 10 from the waist up, transitioning to a 14 at the hip. I found that the neckline was gappy, as shown to the right. That would have been very bad! On the plus side, the lower front fit reasonably well. 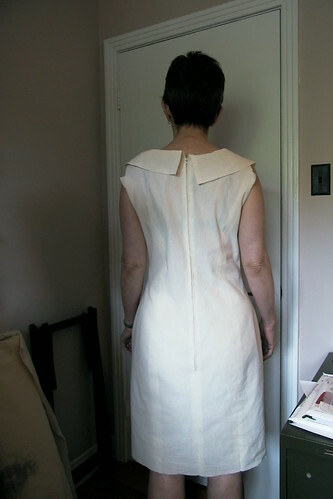 In the back, it was quite sloppy above the waist with fabric pooling in the small of my back. At the sides, I needed to fine-tune the hip curve. 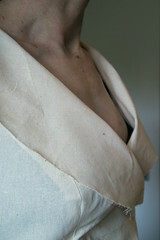 I pinned out approximately 2cm horizontally at the neck edge and collar, transitioning to nothing near the side seams. This required alterations to both upper and under collar pieces, all 3 upper CF pieces and the side front. The mechanics of this were similar to what I had to do on the little top and jacket I recently made. To the right is a picture of the front with my pinned changes. To the left you can see the changes pinned in the back. Next up ... to unveil the dress. I've been madly getting ready for PR Weekend Montreal, which mostly involved sewing my cocktail dress. I'm holding back on showing it to you until it's been seen in person by the 50 or so people who are to be in attendance. It involved a lot - and I mean A LOT - of hand-sewing. That has never been my strongest suit but I'm trying to get over my aversion to it, and to get better at it. I tell you - hand-overcasting about a million miles of princess seams, and hand-felling several kilometres of lining edges, facings etc. is a lot of hand-sewing practice, and as they say, practice makes perfect (or in my case, it improves). The inside of my dress is VERY tidy (and the outside isn't bad either). You will see it soon. In the meantime, have a peek at my latest quick knit therapy, courtesy of Simplicity 2369. I have more than enough patterns, believe me, but this one looked like a dress that would be flattering, comfortable, and suitable for so many outings - sort of like wearing comfy pajamas to work. The resulting dress did not disappoint. I combined the long length, cap sleeves and buckle rather than bow tie at the left side. It went together quickly, was sewn entirely by machine, looks exactly as advertised on the pattern envelope, and is supremely easy to wear. I made it from a cotton/lycra jersey knit picked up on the sale table recently at Fabricland. I love the vaguely architectural print (see the domes?) and the colours. The only faint quibble is that the cap sleeves are a little on the loose side, but again, this is very true to the pattern envelope photo. In this detail photo, you can see the front drape better, along with the black vintage buckle I used. I can't even complain about the assembly instructions. Simplicity included a long skinny piece to finish the neck edge. 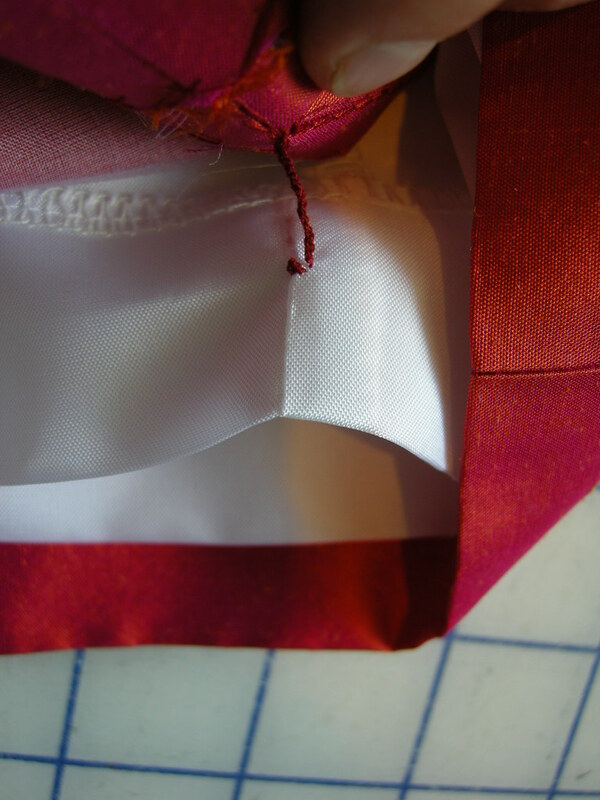 You fold it in half, sew at 1cm (3/8") to the neck, turn to the wrong side and topstitch. It's the perfect length to snug the neck in so it is completely secure. The Sewing Lawyer can really hardly credit it. Silk dupioni; silk organza; hand overcast seams. What is the world coming to? ?